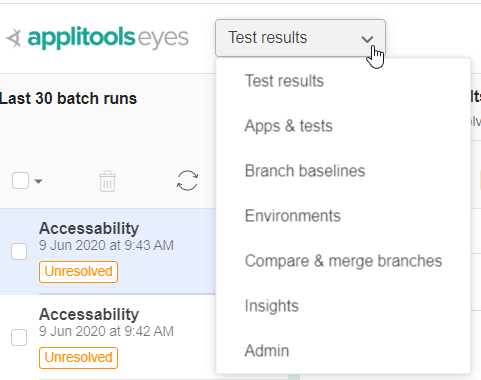 The Eyes Test Manager is a browser-based tool that gives you access to your visual UI test data and allows you to manage the test results, baselines and other meta-data associated with your tests. The Eyes Test Manager UI is divided into a number of pages. Each page supports a different aspect of your visual UI testing workflow. In the section below you can read an overview of the functionality provided by each page. Click on the page name to see the full description of that page. This page displays test run results and allows you to determine if and where the baseline should be updated. On this page, you can easily see if a mismatch was found even in a large batch of tests, and tests with many steps. You can view the captured and baseline images, and determine if a baseline image in some step of a particular test should be updated to the image that was captured in the last run or not. Tools are provided that allow you to annotate the baseline steps by adding issues and remarks and to mark regions that should have a special match sensitivity level. You can assign individual test results to team members to follow up on specific issues. On this page, you can see all the application and test names used in your team's test runs. You can delete or change these names. You can see a list of all the baselines of any application/test pair and can display the history of revisions of any baseline. You can open the test results viewer to see the test results of particular runs. This page lists all the baselines of a branch that you choose. It allows you to search for a particular test or step, organize the test and step information in various ways and to see the test meta-data and step images. You can delete baselines or copy them to other branches. You can see the history of any baseline, compare revisions, and open the test results viewer to a particular run of the baseline. This page allows you to see all the different execution environmentsThe execution environment is defined by the browser, operating system and viewport size when the test was started. These values, along with the application name, test name and branch name determine the baseline that will be used in a run. under which visual UI tests were run by your team. This page also provides a way to assign a name to a specific environment and to rename or delete existing names. This page supports a "branch and then merge" workflow of your baseline. You create a branch by using SDK commands; then, when you are ready to merge the source branch back into the target branch, this page allows you to compare the branches and display any differences and conflicts between the source and target branches. You can change the source branch annotations by copying annotation from a target step, changing existing annotations or adding new annotations. Finally for every difference between the branches you can specify if the target baseline should be updated from the source branch or not. When you have resolved all conflicts, you can request that Eyes finalize the merge. This page provides tools to manage your account, users, and teams. It is only available if you have admin privileges. You can navigate to any of these pages by using the page navigator at the top of the browser page. Just click on the navigator and select the page that you want. The page navigator always shows the name of the current page. In some cases, these are pages that are not directly accessible from the navigator but are opened in the context of another page. The Eyes Test Manager provides various tools that help you sort, group and control the data and images that you see. These tools are available on various pages, and although they don't always provide exactly the same functionality on each page, they do have a common look and feel. You can read an overview of the tools in the article Test manager UI overview.